In early 2008, the author Avis Viswanathan and Vaani – his soul mate, friend, wife and business partner were staring at bankruptcy of their firm. A series of business decisions had literally brought them to the brink of penury. This book is their story. It captures learnings from this excruciatingly painful, life changing phase that they are still going through. A minimalistic cover which straightway draws your attention to the title and a beautiful rose petal that sits pretty. The never say die spirit of the author almost started influencing me from the cover page itself. When there is no option but to fall, then fall like a rose and enjoy every phase! Change is the only thing constant in life. While crests and troughs are life’s buddies which come calling every now and then, there are very few human beings who welcome each situation with a smile. Our author Avis is one such man of steel. Imagine this – bankruptcy knocking at the door, umpteen bills and staff salaries to be paid, two kids still pursuing their studies, no backup/family fortune to fall back on….such a situation is good enough to drive anyone to extreme measures. However, Avis decides to turn this weakness into opportunity. 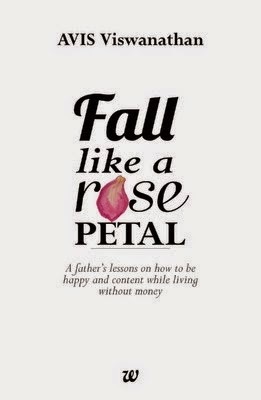 Not only does he keep his cool and deals with each situation wisely, he also foresees an opportunity to share his lessons in life with his children through this book. Now, its not uncommon for people to emerge heroes out of tough situation, but I was left amazed how one could use these situations to show the guiding light to future generations. How many people would actually have the presence of mind to even act wisely, leave apart leaving a message for their kids! The book takes us through a long and painful journey Avis and his Vaani were forced to undertake. Avis shares each and every detail as if he is sitting in front of you and telling a story. There are moments in the book when you feel like crying, while at many occasions you just feel like giving him a standing ovation. While the genre is self help, the book doesn’t sound preachy, nor does it have the “change your life in a week” type message. Instead, it just underscores the wisdom every parent gives us, albeit with real life tested situations. The author, it seems shares a friendly bond with his children and so, never makes an attempt to conceal any detail which might show him weak. Every father is a hero to his kids, but to admit the mistakes and reveal the hardships warrants a lot of guts. Read the book to get a new perspective towards life. Life may not be always rosy but by learning to face the situation with a smile, we can surely make the journey a lot easier. The familiarity the author has managed to create with the audience. After a few pages, you too feel family and it seems like a live conversation full of real life wisdom. There are references to many inspirational quotes; I’m sure not only the author’s children, but anybody who reads will benefit. There is way too much detailing at some instances, for instance detailed description of many people who have been saviors to the author. Leaves you uninterested in them and flip over to the next page. This review is written for WritersMelon. The views are strictly my own and under no influence. The radiant new daughter in law of the influential Mehta family dies mysteriously on the very next night of her wedding. The murder is an inside job, the police are certain. It could be anyone – the adulterous husband, conniving in-laws, jealous friend or the love struck ex-fiancé. Will one of these nine unlikely sleuths finally unravel the mystery behind Gulab’s death and avenge it? Or will the truth die as viciously as Gulab? A beautiful cloth, perhaps a part of the wedding finery decorates the cover and almost took my attention away from the title. Admiring the color, my eyes suddenly widen at the sight of blood oozing out from beneath the cloth. What else lies inside? I wonder then, for never would someone associate “happiness” with murder! And here I read someone talking about being “Happily Murdered”! It was a “dream come true” moment for Gulab. Few hours back, she had married the man of her dreams. The Mehta house was full of celebrations. She regarded the Dancing Pavillion one last time, her feet unable to bear the excitement. And before she could live more of this dream, it was time to say goodbye to this life. 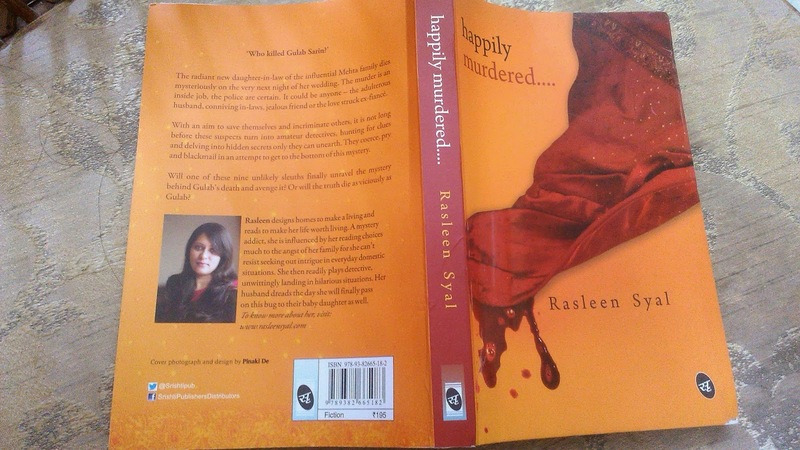 The story begins on a somewhat shocking note, with a young and happy Gulab dying mysteriously on her wedding night. The wedding hustle and bustle in the house suddenly transforms into media and police activity. On the radar is every person in the house – Gulab’s husband Sid, her in laws KD and Tina, her business partner Vikram and his wife Monica, Monica’s sister Sara who was once engaged to Gulab’s husband, Gulab’s ex Ned, and even Gulab’s best friend Yuvi. While the police struggle to nail the killer, there is a different sort of struggle in the house. Like the empty bottle in the truth and dare game, everyone is trying to save himself/herself whenever all eyes fall on him/her. Having fed on a generous diet of Agatha Christie books, the debut author surprisingly knows how to keep the readers hooked. With every family member becoming a self proclaimed detective to nail the true killer, the story oscillates between flashback and present. The beauty lies also in the way Gulab’s life, hopes and feelings are expressed in her own voice, even though she is dead in the first page. I wondered then, was I reviewing a debut work, for the book has all the elements of a perfect murder mystery! Frequent references to various quotes bring the reader closer to Gulab’s state of mind, and by the time the mystery is unraveled, the reader feels a strong sympathy and pain for her. I would strongly recommend the book if you are looking for a good mystery read. But a word of caution though – chances are, you won’t be able to keep the book down unless you have read till the last page in one go! With a debut penned with such finesse, I look forward to the Rasleen’s next book. Expression of Gulab’s feelings in her own voice, since she is a deceased character; strikes an instant chord with the reader. Despite being a debut, I was impressed to see no traces of drags and unwanted descriptions that is found in many books. Also, the pace of the story is just right with each part given its due attention. The sudden improvement in relationship between Sara and Gulab was a bit hard to chew. Few typos sneak into the otherwise perfect language. A mystery addict, Rasleen considers Agatha Christie her Guru. She designs homes for a living and loves to seek mystery in everyday domestic situations. This is her debut. Life as a kid was at its blissful best. With a day full of activities and quality time spent playing with friends; BMR (basal metabolic rate) was always on the go. In a healthy body resides happiness, we all know. However, something attained without hard work is often taken for granted. That’s exactly the case with our dear friend, health. As we run on the highway of life, all the things lucrative pile up on our priority list, promising us happiness. We break the red lights, adopt short cuts to success, thinking that pinnacle of success will bring us true happiness. What we ignore sadly is that in order to enjoy the good things in life, we need a healthy body and mind. So, early morning rendezvous with nature is replaced by coffee and extended newspaper session, evening sports by social networking and channel surfing, good night sleep by odd working hours, and wholesome natural food by quick fix junk delicacies. The consequences don’t take much time to show though – loss of stamina, glow wiped from face, growing waistlines, irritability, etc. But, blinded by the lure of materialism, we blame it on hectic work schedules. In case you are looking for some more motivation to get going, here’s a video that shows us how to enjoy and get fit in style. Not only will it help you stay fit, it will also help you save some bucks! A 15 minute walk or a 20 minute exercise session won’t take away much of your time, but it will definitely help you feel lighter enough to take that flight to a happier you. Learn to laugh the stress out and share happiness with others. With smiles flowing around, we can definitely ward off the stress that poses threat to our health. While those cookies make for a perfect high tea and the chocolate pastry, the perfect midnight sin, we turn a blind eye to the after effects of processed foods. Just like childhood, when mom ensured there was enough of natural goodness in our food, we too need to discipline our taste buds. And thanks to awareness among many brands, it isn’t a hard nut to crack anymore. 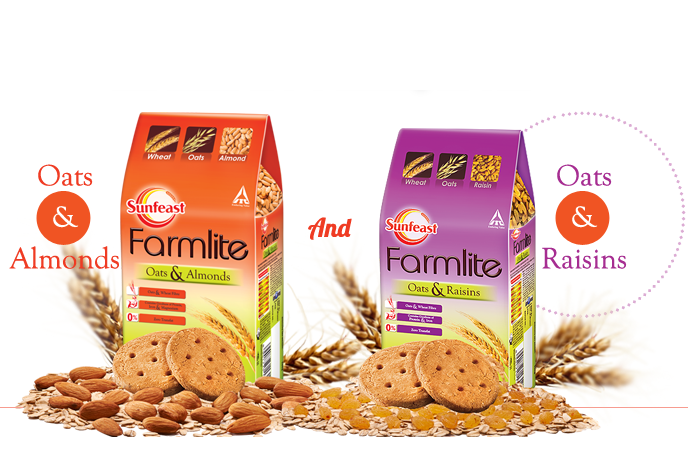 We just need to say hello to the goodness of whole grains, fruits, vegetables, nuts and good fats. The markets are full of healthier options that are generous to the taste buds as well. 6. Back with a bang! Staying healthy is not rocket science. Just a bit of effort and sticking to the basics will do the trick! What is important however is to keep the fun element alive and enjoy every baby step to a good health. After all, it’s the journey that matters more than the destination. All videos above are courtesy the Farmlite Bytes Film festival. With portraits that both touch and disturb, corporate politics, Mumbai night life, Dalal Street, lower middle class Delhi and psychological “illness”, the Bluest Marble is a sensitive exploration of young urban aspirations and angst in the age of economic turmoil. A lone tree sans any leaves make for the simple cover. But there is also blue marble (kancha) sitting pretty on one of the branches. Makes me wonder…no matter how sad things are, there is always a ray of hope. The words below the title somehow confuse me, “Is it always about loving your friend and family?” I open the book to read why the author feels so. The book begins with the fast pace life of amchi Mumbai. An investment banking job worth flaunting, a luxurious living, a bachelor pad with college friends Rakesh and Jitu, a mean machine, who well, does more than just transport Aditya’s life was at bloom with happiness. Then slowly, autumn strikes and the leaves start falling. Still not recovered by the heartbreak from a lost love, his career faces the wrath of a turbulent economy and he loses his job. It is then that he realises the utopian world he had been happy with was somewhat a fallacy. That his friends had been just “the friends in good times”. Aditya also has a strange tendency to hallucinate. So after every few pages, you see him hallucinating about his ex girlfriend or even with his bike. While it is tolerable the first few times, the dragged dialogues with no value addition prompt the reader to flip the next page and find something meaningful in the story. The next part of the story shows Aditya running away from his dismal present to find solace. But the more he runs, the noisier it gets in the mind. There is a very detailed account of his home in Adarsh Nagar in Delhi. And by detailed description, there is so much of it that at one point, I wondered if the author belongs to that place and has got emotional while penning down the debut. If not, a crispier account too would have been welcome. Peace and self realisation finally comes calling, not in the company of loved ones, but alas, in a mental hospital in the company of fellow patients. Well, that’s the irony of life! How? The review doesn’t offer spoilers so read the book to know more. It is here that the story takes a serious turn, and you empathise with Aditya. I really liked the description of Aditya’s self discovery under a keekar tree, akin to Buddha’s enlightenment under the Bodhi tree. But just when I wanted a detailed account, I see a hurry to draw the curtains. The discovery of the secret to happiness and the discovery of bluest marble is all so concise that I wondered what suddenly happened that had not happened in the last 250 odd pages. Then the last few pages show the sudden transformation and good times, like the climax of a regular Hindi movie! Overall, I appreciate the thoughtfulness of the author to try something different in the debut itself. Hope, the expression will improve book by book. Despite the few shortcomings, I recommend the book for a good attempt at a different flavour. The book will at some point make you think about your life too, the ups and downs that went by and the blue marble that each of us can find within us. The hallucinations with the ex girlfriend and the dialogues with the bike get over after a point. The Delhi darshan account could have been crispier and much more time could have spilled over to the actual crux of the story in the climax. After co-authoring award winning plays at IIT Bombay and penning numerous unpublished stories and poems, this is Vipin Kumar’s maiden attempt at being published. With a passion to tell an “honest story”, Vipin actually admitted himself in a hospital to do justice to the hospital episode in the book! Hope to read more good works by you Vipin. This review is for BecomeShakespeare.com. The views are strictly my own and under no influence. What would you like to have - Million or Crore? What has happened to me today? You must be wondering. Some of you must be finding me crazy or dumb wondering why do I wanna write something when I have no thoughts in my mind? Well, however dumb it sounds, I have a point in quoting the above conversions. Not that I am starting a section on academics! You see, in primary school, when the foundation of our elementary mathematics was laid, all we were taught were thousands, lakhs and crores. Thousands meant very expensive, lakh was a big figure and crore was a figure one only heard of in television. That’s 80s and 90s childhood for you. Life was beautiful till school and even graduation. However, a post graduation in finance saw frequent encounters with millions and billions. While it was more about cracking the numerical back then, they seemed fairly tolerable. However, the real problem began when I stepped into the corporate world. Everything everywhere is quoted in millions and billions. While technically it is not at all a problem, I am somehow miss my old friends – lakhs and crores. Now, when someone quotes a figure in millions and billion that needs an opinion, the mind goes back to lakhs or crores within fraction of a second and that’s when I can infer whether it is a figure to bother about or not. Somehow, even today, if I have to conclude how expensive something is, or the extent of financial implications, my old friends lakhs and crores come in handy. The answer goes back to the 80s when focus was more on the Indian Numbering System. While teachers took us briefly through the international numbering system, everything around us was quoted in lakhs and crores. However, in the global arena, there needs to be uniformity, and hence, millions and billions get away with the cherry on the cake. 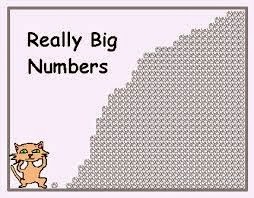 Do you face the same fraction of a second calculation every time a figure is calculated in millions and billions? Or the world around you has always valued money in these number? P.S. We are lucky we just have millions and billions in our life. Look at this page on Names of Large numbers and you will realize life is still beautiful!